Recently I attended the Wisconsin Sustainable Business Conference as a speaker on “The Profit in Sustainability”. After the event, one of the other speakers on my panel (AJ Gordon with Gordon Aluminum Industries – http://www.gordonaluminum.com/) sent me an e-mail follow up, and was wondering about the life-cycle of t-shirts. He is in the aluminum manufacturing business; and in his industry all the scrap is melted down and reused. As someone who has been in the decorated apparel business I have probably more t-shirts than your average guy. The majority of them are shoved into my closet or drawers, and are all usually items that either I designed or had a part in the printing process for an event. In the basement, I have boxes and boxes of them. Why am I saving them? I have no idea. As time marches on, I’ll add to the collection too. I’m positive that the average person on the street has a big collection too. Let’s face it, we love t-shirts!! I’m happy and proud of this fact as it supports my family every day. But you have to wonder why we hoard all these t-shirts and if maybe there’s a better repurposed use for them? Do I really need to keep them? Do you? So, do you think that is true with t-shirts? Maybe I don’t get out enough, but I’d say that this quote may be true for other products, but not so much with t-shirts. Sure, your average consumer probably wears their favorite shirts for decades and then relegates them to the “can’t throw it away” pile, or maybe if they are crafty sews it into a quilt, a rug or something. A good percentage of folks probably donate to their local homeless shelter, Goodwill, or charity clothing drives every year or two. Shirts also see a second life from garage sales, and hand me downs as well. But is that “melting them down” like the aluminum block example? How many T-shirts currently exist right now that are like mine – just stuffed into a box in the corner and forgotten? Repurposing is one thing; completely recycling the material is another. Looking at the product life cycle “cradle to grave” generally there are five stages in a products life cycle: Raw Material Acquisition (growing the cotton), Manufacturing (making the t-shirt & decorating it), Distribution Storage & Retail (selling the shirt), Use (you actually wearing the shirt), Disposal and End of Life (what happens to the shirt). (Recently there was a great segment on NPR Planet Money on t-shirts that’s worth watching if you want to see some video footage on the product origins of your average t-shirt – http://apps.npr.org/tshirt/#/title.) So that being said, is there a cost effective way to take the discarded t-shirt and use it as a resource for fibers to make another product? Actually there is. Cotton is a lot like paper in that the fibers can be broken down and made into new things. This is important, as if consumers want to make a difference they can shop for items that are constructed out of recycled content fibers. The more of the demand for this type of item, the more fibers may be kept out of landfills as the demand for this material stream will increase. According to the EPA, a little over 5% of the stuff that goes to landfills is textile waste. (http://www.epa.gov/osw/conserve/materials/textiles.htm#facts) That’s why keeping your old t-shirts out of the landfill is important, but it is just not always crystal clear to your average consumer. When you donate your clothing to a local charity your t-shirts are sorted according to quality. 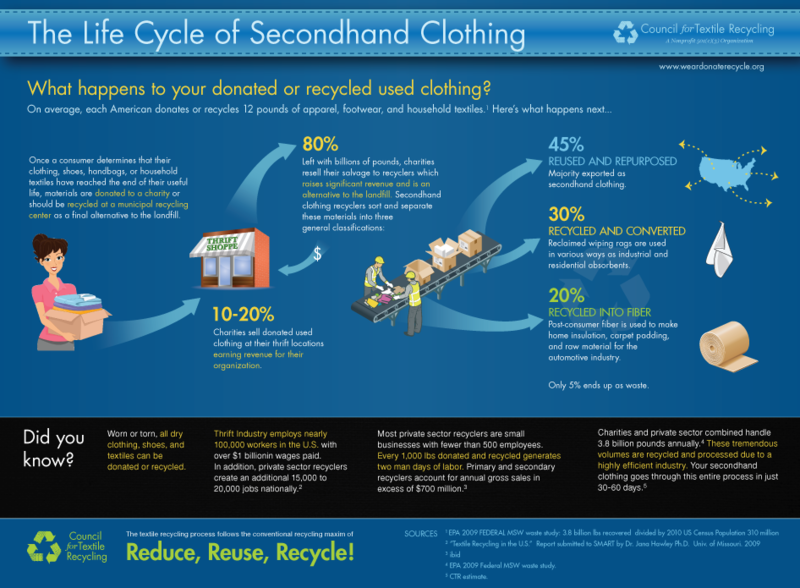 According to a Council on Textile Recycling study (http://www.weardonaterecycle.org/images/clothing-life-cycle.png), 45% of items donated are resold or repurposed as secondhand clothing. 30% are recycled into rags, and the remaining 20% is converted into new fibers that end up as carpet or fibers for industry. The remaining 5% goes to landfill. So at the end of the day, where are we on the subject of repurposing t-shirts? Probably in the infancy of a better movement in my view. As it takes more and more valuable resources to grow cotton and have it converted into fibers to make t-shirts, I think you are going to see more apparel being constructed from recycled synthetic materials (the polyester content in your 50/50 shirt) and more t-shirt manufacturers taking a harder look at recycling cotton fibers from the consumer waste stream. However, to make it a fully operational function of their process they are going to have to take a better approach similar to how Patagonia has staked out and make it easy for consumers to get the material into their hands to be repurposed. As a t-shirt printer, maybe that means we need to become a source point for that collection. We are already segregating our cardboard, paper, plastic, metal, and other materials for recycling. Adding one more item to that could be something that we could take a closer examination and see if we could make a difference. It all has to start with the industry supply chain communicating together and understanding steps to make it a reality. Who is going to lead that effort? I’d love to hear your viewpoints on this subject in the comments section below!! Let’s start the conversation with a simple question “what do you do with your t-shirts that you don’t wear”? First step is Goodwill if they are in decent shape, if not then it is off to the test-print pile. But after we have used all of the print area it is off to the trash can. With all of the plastisol buildup it is hard to see a renewed future for the shirt other than the landfill. Sure, we do that too… However, the idea here is the boxes and boxes of t-shirts that nobody wears that are stashed around in basements, closets and garages. What if everyone recycled these shirts and the fibers were converted back into something useful? I think we can do something better… The question is a just a big “how”..
nice articles Mr.Atkinson.. i like your post. I enjoyed your post & really the cheerleading to further discuss ideas. Of course recycling isn’t the solution- but it is an option. The average American throws away nearly 80lbs of clothing into our waste streams each year- only 15% of US textiles are processed for recycling. 95% however can be recycled or reused. Accessibility to responsible (and transparent) drop of locations for collection increase the community involvement to some degree however my experience is that unless you’re willing to do the pick up work for them. I’ve helped establish programs to take back and process used textiles across the country- working with small municipalities and larger cities like NYC. It can be a valuable income stream for communities who are willing to integrate textile recycling as a curbside pick up like those in in New Jersey, Arizona, Massachusetts, Pennsylvania, and Washington State. However I strongly believe that the best resource we have, is our children. This perspective relies on the ideas that we owe it to their future to equip them with problem solving skills and encourage creative, imaginative, and innovative solutions- changing the way we consume and create through re-imaging our waste. Reusing materials and having the ability to reinvent them using their existing properties; also known as upcycling or repurposing.